FP-DAQ1616 is a data acquisition I/O card integrating Diamond's newest and fastest analog I/O technology and a PCI Express host interface. This tiny board offers 16-bit or 12-bit A/D sampling at up to 2MHz, supported with an expanded 16K-sample FIFO for reliable data collection in any operating system. Analog output capability has been expanded to 16 16-bit channels with programmable output ranges. All analog I/O features are enhanced with our industry-leading autocalibration technology, featuring independent calibration factors for each input and output range to guarantee maximum accuracy across all operating modes and the entire operating temperature range. 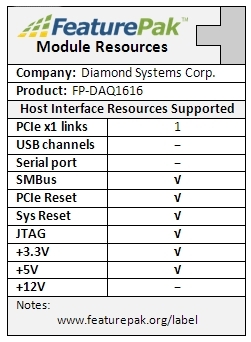 Diamond's exclusive Universal Driver Software is included at no charge along with the FP-DAQ1616 I/O module It provides a high-level programming library for all of our I/O boards, as well as for the data acquisition circuitry on our SBCs and Embedded-Ready Subsystems. All data acquisition features are supported by easy-to-use function calls, resulting in a reduced learning curve and shortened application development time. The Universal Driver works with Linux and Windows XP. Application examples and projects are included for each function, each board, and each operating system, in order to provide a quick starting point for learning and development. Learn more about our Universal Driver software here. The FeaturePak™ Trade Association, originated by Diamond Systems, was launched at the Embedded World tradeshow in March, 2010. The FeaturePak Specification defines a highly-compact, low-profile, and inexpensive way to add configurable I/O functions to embedded systems. The tiny FeaturePak modules -- measuring just 1.70 x 2.55 inches (see photo at right) -- can be used for providing snap-in options or upgrades for off-the-shelf single board computers (SBCs) and computer-on-module (COM) baseboards, or as building blocks to simplify the development of fully-custom embedded electronics. Additionally, FeaturePak modules provide "zero height expansion," in that they fit within the normal component envelope of an SBC or COM baseboard and add no height to PC/104-style I/O expansion stacks. 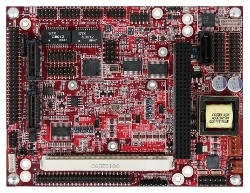 Learn more about the FeaturePak embedded I/O expansion standard here.